I thoroughly enjoyed Bert Hansen’s talk on representations of medical issues last week. As noted, he found 1100 articles devoted to medicine in his study of Life Magazine. His focus on Life Magazine thoroughly reinforces how this publication was a leader in a golden period American news photography (1930s-1950s). Henry Robinson Luce launched Life Magazine in 1936 using the key strategy of the photo essay, a group of photographs arranged to explore a theme or tell a story. As Hansen notes, Luce wanted Life Magazine to be a pleasure to look because this will help promote “information that sticks.” The combination of word and text was a powerful means to humanize politics and science. The actual format of the magazine enhanced the pleasure of looking and reading, most notably it’s large -size format and the use of a heavier coated stock with a glossy sheen. These effects aren’t so evident when you’re looking at slide reproductions so I’ll bring in copies to our next meeting. The images in Life Magazine are exceptionally vivid, such at the one by Margaret Bourke-White of Fort Peck Dam that graces the cover of the first issue of Life. Bourke-White was the first woman photojournalist to work for Life (she was also the first woman photographer to work in combat zones during World War II). What needs to be contextualized for the impact of Life Magazine’s entry into the publishing world, is that it’s first issue is published during the Great Depression. Therefore, something so beautifully produced would have looked exceptionally luxurious. Lastly, Luce was brilliant with spearheading the way to combine photos and text to tell stories powerfully to mainstream America. To this end, he hired some of the premier photographers of his time, including Eugene Smith who photographed for the 1948 series of the Country Doctor and the 1951 series on the Nurse Midwife. 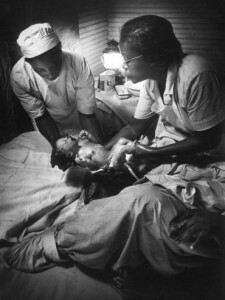 You can see the entire series online on the Life Magazine’s website, including images that were not published. This entry was posted in Uncategorized and tagged Bert Hansen, doctors, Life Magazine. Bookmark the permalink.